The reality is that not all generator power cords are created equal. It's not that some are worse than others, but rather that not all are appropriate for every generator. Choosing the wrong cord can result in wasted power or damage to your generator and appliance. While portable generators are measured by watts, generator power cords are measured in amps. The larger the amps, the more electricity the cord can handle. For example, a 50-amp power cord is a lot thicker than a 20-amp power cord. This allows it to handle a larger wattage (more appliances). Each of the outlets on your generator will have a certain amount of amps they can handle. You simply select a power cord that matches the most powerful outlet on your generator. So, if you have a 50-amp outlet, you'll need a 50-amp power cord. If you have a 20-amp outlet, you'll need a 20-amp cord. Choosing a lower-amp cord will result in wasted power potential and possible damage to your equipment. The plugs and connectors are purposely designed in different shapes to help prevent an electrical overload. If you have a 30-amp or 50-amp outlet, pay special attention to the shape. For example, 30-amp plugs come in two varieties: 3-prong and 4-prong. The 3-prong plugs carry 120 volts only, while the 4-prong plugs carry 120/240 volts. The 4-prong varieties are becoming more popular because homes are increasingly starting to carry 240-volt outlets or appliances. If you have a 50-amp outlet on your portable generator, you will most likely need a special power cord with two different ends. The straight-blade male plug will fit into the generator. 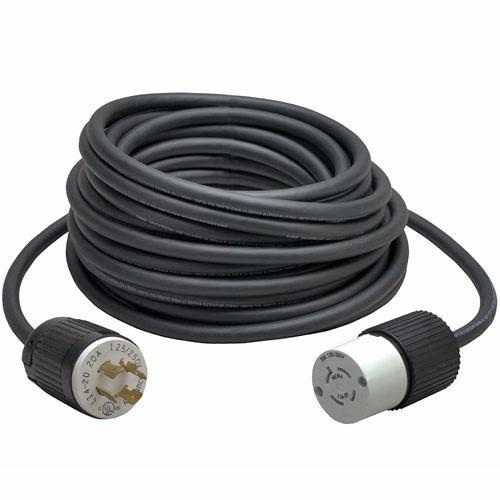 The twist lock female connector will fit into a transfer switch or power inlet box. Before connecting your appliances, double-check that the generator cord is undamaged; this includes cuts and frays. Using a damaged cord can result in electric shock. If you take heed of the cord's amps, shape, and follow safety precautions, you will be good to go to stay powered. How to Buy a Generator Power Cord. Electric Generators Direct.com offers expert advice on what to look for when buying a power cord for a portable generator.